Bora Bora is our top request and rightly so- there are pictures all over the internet of overwater bungalows dotting the famous lagoons with the iconic Mt. Otemanu in the backdrop. If you want to be able to see that exact scene from the beach or the deck of your overwater bungalow, then the InterContinental Bora Bora Resort is the place to stay! The InterContinental Bora Bora Resort is unique for several reasons and one of those reasons is that there is only one room category- all of the rooms at the resort are overwater villas! There are 80 villas at the resort, and while there are five distinct categories of overwater villas, the size and interior of the villas are exactly the same. The categories vary based on location on the pontoon and view. The Emerald villas are closest to the beach and have a view mostly of the beach and resort. The Sapphire villas are toward the center of each pontoon and have views of the lagoon. The Diamond villas make up the last three categories. The standard Diamond villas are on the outer edge of the pontoons and look out toward the main island and Mt. Otemanu. The Diamond Otemanu villas are in the inner edge of the pontoons with direct mountain views. The End of Pontoon Diamond villas are what the name suggests- the villas at the end of each pontoon arm. These have the most direct view of the main island and Mt Otemanu, as well as offering the most privacy. So, what else makes the InterContinental Bora Bora Resort unique? 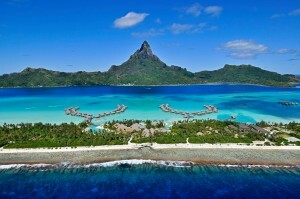 Like many other resorts throughout the islands, The InterContinental Bora Bora Resort has a sister property. However, it’s sister property is just across the lagoon! 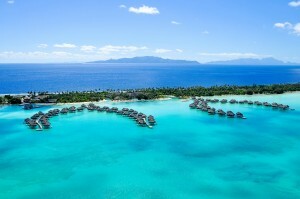 The InterContinental Bora Bora Le Moana Resort is located on the main island of Bora Bora on beautiful Matira Point. While the Bora Bora Resort is more luxurious and modern, Le Moana has a more authentic Polynesian vibe and is a bit more along the lines of a boutique property. There is a complimentary shuttle than runs between The InterContinental Bora Bora Resort and Le Moana several times a day, affording guests at the Bora Bora Resort easy access to all the main island has to offer. In addition, guests of the Bora Bora Resort are free explore the property at Le Moana and even dine on the property with charge back capability to their room. The InterContinental Bora Bora Resort is also unique for what it offers on the property. The resort is the first of its kind to use deep sea water as a major element in running the resort. The water is used to air condition the rooms, as well as in the expansive spa. The Deep Ocean Spa is the first Thalassotherapy spa in the South Pacific and is the only spa in the world using the benefits of water drawn from the depths of the Pacific Ocean to administer treatments. 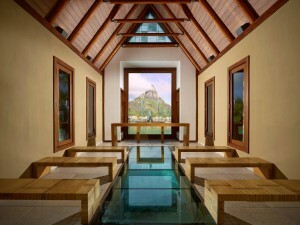 The Deep Ocean Spa offers many amenities, making the Bora Bora Resort a true spa destination. There are glass-floored overwater bungalows enabling you to admire the marine life during the sessions you choose. In addition, there are relaxation areas with an unobstructed view over the ocean, multi-sensory outdoor spas, steam baths and showers, a fitness room, a tea lounge and a boutique. In addition to the spa, the Bora Bora Resort offers many activities on the property. Outrigger canoes, kayaks, pedal boats, and boccia ball are all offered complimentary. For an additional fee, you can also set up dives with the onsite dive shop or arrange various excursions around the island of Bora Bora. The resort also offers authentic Polynesian experiences, such as pareo tying classes, palm frond weaving, and Polynesian shows. The final unique feature of the Bora Bora Resort is its stunning wedding chapel. As weddings in French Polynesia are now legal for most foreigners, the Bora Bora Resort decided to create a one-of-a-kind chapel over the water. The chapel has a direct view of Mt. Otemanu in the distance and has large panels of glass on the floor, allowing you to view the sea life below. It’s the perfect place for a destination wedding or vow renewal. The resort also offers a variety of special romantic touches that can be added to any stay for an additional fee. Bora Bora is reached via interisland flight on Air Tahiti followed by a 20 minute ride on the resort’s private boat shuttle. The InterContinental Bora Bora Resort also features boat shuttle transfers to the main island of Bora Bora and the Le Moana property. We highly recommend a stay at InterContinental Bora Bora Resort if you are looking for a modern, chic resort, an expansive resort property, commanding views of the main island, an exceptional spa and/or access to a secondary property. A stay at the Bora Bora Resort pairs well with a stay on any island, but is an excellent choice when also staying at the InterContinental Resort in Moorea. We recommend at least 3 nights on any one island, but Bora Bora has a lot to offer and can easily be enjoyed for stays up to a week! For additional information on the resort, please feel free to check out my review of the property. Please contact me with any additional questions or to book your Bora Bora Escape!! !